These are the settings we used to calibrate the Samsung 55 inch UN55NU8000 TV and we expect them to be valid for the 49 inch version (UN49NU8000), 65 inch version (UN65NU8000), 75 inch version (UN75NU8000), and 82 inch version (UN82NU8000). These are suitable for any content, from watching movies to TV shows and gaming. For Gaming, some adjustments need to be done, and they are listed below. 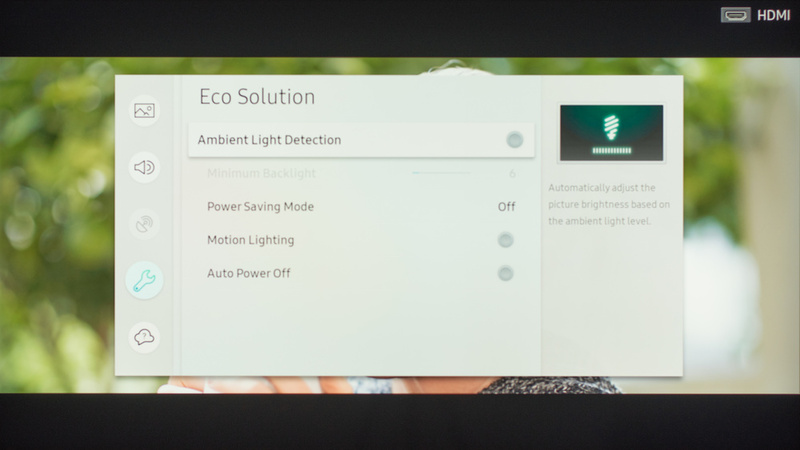 The first thing we did was to turn off all of the 'Eco Solution' settings since we didn't want the backlight level to change during our calibration. This is recommended if you don't want the brightness of the TV to change automatically depending on the room brightness. For movies and TV content, the 'Movie' 'Picture Mode' gave us the closest result to our calibration goal and it should bring the image quality closest to what the content creator intended it be. A 'Backlight' setting of 11 gave us a luminosity closest to our calibration target of 100 cd/m². 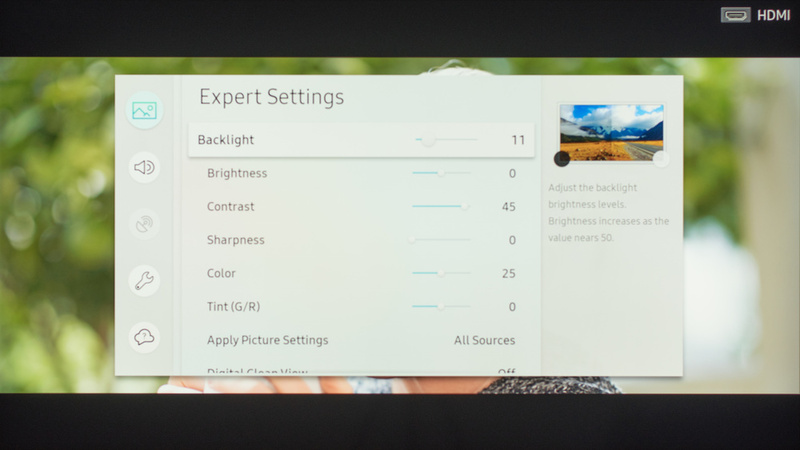 Changing the backlight setting has no impact on picture quality and you should adjust this depending on the brightness of your room. We left the 'Brightness' to 0 and the 'Contrast' to 45. We left the 'Sharpness' to 0 to avoid any oversharpening. We left "Color' to 25 and the 'Tint (G/R)' to its default value of 'G0 and R0'. 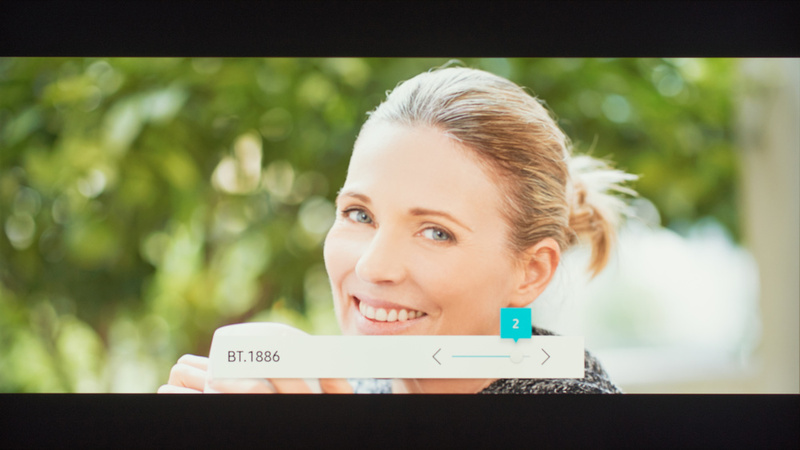 We turned off the 'Digital Clean View', but if you are watching some older low-resolution content, you may want to set it on to make the content smoother and with fewer compression artifacts. For our calibration, we left the 'Auto Motion Plus Settings' Off, but if you like the Soap Opera Effect, 'Auto Motion Plus Settings' is the setting that is related to the motion interpolation. We set the 'Local Dimming' to 'Low' for the calibration (usually, we turn it off for the calibration, but it is not possible for the NU8000). 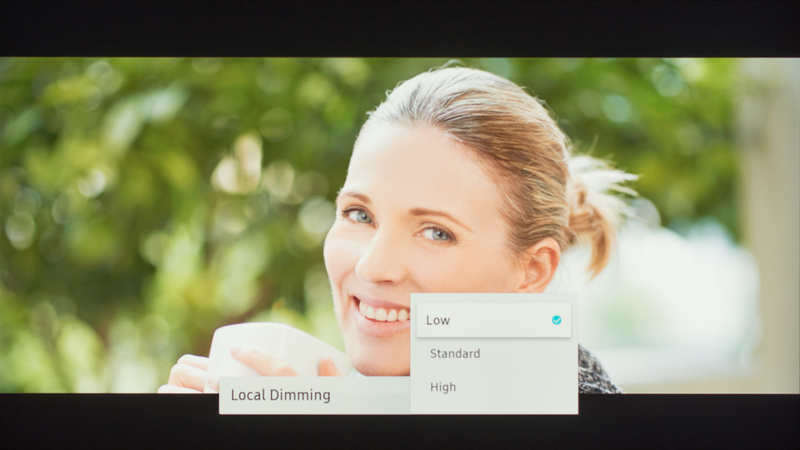 Like most Samsung edge-lit TVs the local dimming feature is not very effective, so we recommend you use whichever setting you prefer. 'Contrast Enhancer' was left turned off since we don't want to add any extra image processing to keep the content as faithful to the original intent. The 'Auto Motion Plus Settings' is the menu that controls the motion interpolation and the way the TV deals with judder. This is also known as the 'Soap Opera Effect'. If it is turned off, the TV won't be able to remove judder from any sources (Blu-ray players, native app or cable boxes). To get the best judder-free movie experience you need to set the 'Auto Motion Plus' setting to 'Custom', set the 'Blur Reduction' to 0, set 'Judder Reduction' to 0 and leave the 'LED Clear Motion' unticked. This won't add the soap opera effect. The 'Auto Motion Plus Settings' also control the NU8000's motion interpolation. Since it has a 120Hz panel, it can interpolate lower frame rate content up to 120Hz. To do so, set 'Auto Motion Plus' to 'Custom' and increase the 'De-judder' and 'De-blur' sliders. The 'De-judder' slider affects 30 fps or lower content, and the 'De-blur' slider affects 60fps content. For both sliders, you can adjust the setting to your liking to add more or less soap opera effect. We selected the 'Warm2' 'Color Tone' since it was the closest to our calibration goal, but you can change it to a cooler 'Color Tone' if you find the color too yellow or red. The gamma setting adjustment was set to 2 since it was the closest to our calibration goal. The TV will automatically set the Gamma type automatically depending on the content. You should only adjust the gamma curve with the slider (plus or minus) if you find there is black crush or if dark scenes are not deep enough. In the 'Color space' setting, it is preferable to leave it to 'Auto'. When set to auto, the color space changes to match the type of content you are watching automatically. Setting the Color Space to 'Custom' will allow calibrating the TV for SDR content. Normally we do not recommend doing this as the TV is already fairly accurate out of the box. If you set the Color Space to 'Custom' you will have to adjust the settings each time you change from SDR to HDR. For watching HDR content via an HDMI connection, it is important to set the 'HDMI UHD Color' on for each HDMI input that will receive the HDR content. This will permit the HDMI port to transmit all the bandwidth needed for HDR and tells the TV to expect a 10-bit color signal on that input. If the 'HDMI UHD Color' is not turned on, some devices will not detect the NU8000 as being compatible with HDR. For HDR content, it is also preferable to set the 'Backlight' to maximum, set 'Local Dimming' to 'High' and set the 'Color Space Settings' to 'Auto'. To enable Game Mode, select 'External Device Manager' from the 'General' menu, and then select 'Game Mode Settings'. Set 'Game Mode' to 'On'. For SDR gaming set 'Sharpness' to '0' to remove any sharpening. To enable chroma subsampling when playing from a PC, set the input icon to 'PC' under the 'Input Device Manager' submenu. On the NU8000 Samsung has added new options for Game Mode including the ability to interpolate lower frame rate games up to 120Hz. 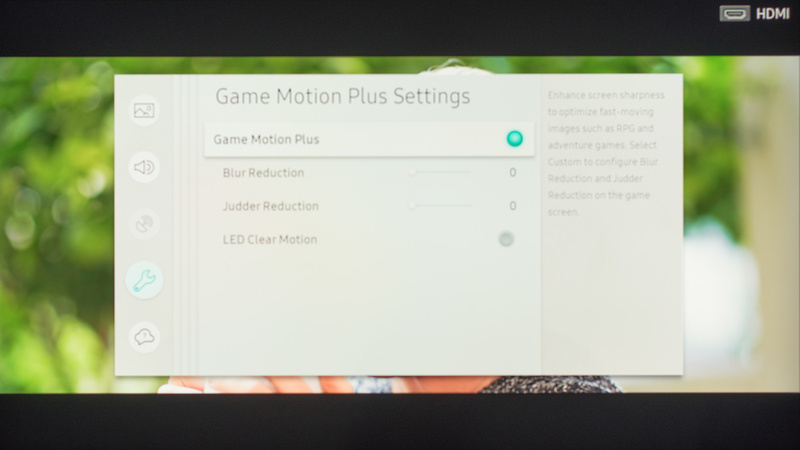 To enable motion interpolation select 'Game Motion Plus Settings'. From there you can adjust the 'Blur Reduction' and 'Judder Reduction' sliders to whichever you prefer. For HDR gaming apply the same HDMI settings mentioned in the HDR settings and game settings above. Note that when in game mode, the TV won't change the backlight setting and the local dimming setting automatically, so it is preferable to set the backlight to max and set the local dimming to high. When using the NU8000 for HDR PC Gaming, there is currently an issue with the 'Standard' picture mode where the screen became very dim and we were unable to change it. In this case, all of our settings apply for the 'Dynamic' picture mode instead. It is especially important to choose 'Warm 2' in the color temperature settings.